Clan Wood appeared alongside Clan Maclean and Clan Broun to open the Royal Edinburgh Military Tattoo at Edinburgh Castle in the evening of the 9th of August 2017. As two long columns of betartaned clans-people paraded on to the castle esplanade, the 9,000-strong audience filling the lofty stands on three sides let out a roar of applause. First came four splendidly uniformed pipers beautifully playing alternately the two stirring marches that were specially written for the Inauguration of our chief in 2011: "Sir Andrew Wood's Flower Battling Home to Largo" by George Wood of Kirkcaldy, and "The Yellow Caravel" by Diarmid Lindsay of Colinsborough, the Earl of Crawford's personal piper. Then came the three chiefs - one being our sadly indisposed chief's official representative - and their spouses walking six abreast leading the flag-bearers and the colourful ranks of cheerily waving followers. The atmosphere was truly magical and culminated in the chiefs being welcomed by the castle's officers with a Gaelic Loyal Toast and a goodly dram of single malt taken from traditional silver quaichs. More applause pursued the clans as they dispersed to their seats in the stands, the chiefs' party to the Royal Box, to enjoy the ensuing Tattoo performances. Every person who has the same surname as the chief is deemed to be a member of the clan. Equally, a person who offers allegiance to the chief is recognised as a member of the clan unless the chief decides that they will not accept that person's allegiance. if you are the partner or a near descendant (e.g., an other-named married daughter) of someone of the Name, then you are already a member of Clan Wood as part of your heritage. then you are welcome to be a member of this Society. If you would like to become a member of the Society, then click on Join/Support in the main Menu. Representing an ancient clan/family whose continuing line of Lothian and Fifer chiefs dates back to the 12th century, and whose lairds have governed lands in the north and south of the country, the Society exists to promote the spirit of clan fellowship, Scottish traditions and friendly relations with other clan and family societies. We are building a knowledge base about Wood history and culture, genealogy, individuals' achievements and lots more besides. The Society provides supportive links between its members worldwide and those of the greater clan it serves. The wearing of the clan/family tartan is encouraged. We seek to maintain close ties with Wood Clan organisations throughout the world. 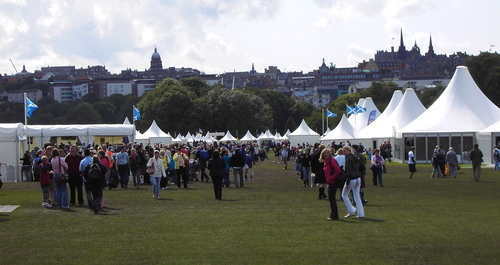 during the landmark 2009 international Gathering in Edinburgh. and heard numerous fascinating family stories from many parts of the world. Clan Wood participates in annual events such as at Greenville, South Carolina; Portland, Oregon and Radford, Virginia. Click on Contact Us and ask for the latest news from the Secretary. The Clan Wood Society aims to take part in all Scotland's international Clan Gatherings. The Council is always keen to see the Clan represented at similar events throughout the world. Invitations from organisers are welcome. They and people wanting to take part should submit their event details to, or request practical setting-up assistance from the Secretary by clicking on Contact Us. known heraldically as a Sprig of Oak. Crest Badge that is worn on the cap, lapel, sash etc. - or just by itself. Examples of the Crest Badge can be seen in the Clan Shop. Call in to the website's Clan Shop, where you will find high quality items at affordable prices. First and foremost, the shop provides a service that lets you easily obtain items made in the Wood tartan, as well as our iconic Crest Badge insignia that will identify the owner with Clan Wood and its families. The modest funds raised help to cover some of the costs borne by the Society on research projects and of proclaiming the Woods' contribution to Scottish history and culture, especially at public events and through this website. To celebrate the accession of our 19th chief, Timothy Wood of Largo, we gave him a Reception at Upper Largo, Fife, Scotland on Saturday the 21st May 2011, when he was presented with his distinctive silver bonnet badge that has the traditional three eagle feathers reserved for clan chiefs alone. This was his first official engagement and was a truly historic occasion for his family and clan. The ceremony was followed by a buffet lunch and a short walk to Sir Andrew Wood's Tower that formed part of the baronial residence fortified by that illustrious Founder of the present line of chiefs, then on to the kirk where generations of the chief's ancestors worshipped. You can see some video shorts and photographs of the event through a youtube link, and you can ask for a DVD of the Inauguration, both in the Bulletins pages of the Members' Area. "Do please convey to your chief and your members my good wishes and congratulations." - The Earl of Crawford and Balcarres, Premier Earl of Scotland and chief of Clan Lindsay. Our chief's ensigns (heraldic flags) are those of a baron of Scotland, and can be viewed in the Members' Area. He is a member by rank of the Standing Council of Scottish Chiefs. A thrilling account of the personal life and history-changing career of a supremely accomplished and unique individual, Admiral Sir Andrew Wood of Largo, this ebook benefits from the very latest research into the man and the background that made him. It portrays in the round (i.e., 'warts and all' and with some strong dialogue) the personalities of many of his famous and less well known contempories, while placing his adventures and violent clashes at sea in the context of what else was happening in the world at the time. 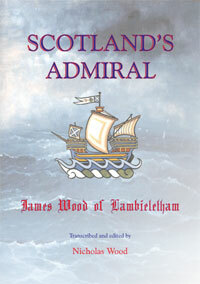 "Scotland's Admiral" can be purchased for £3.95 in the website shop. Just click on The Clan Shop in the menu on this page. You can read in the pages of this website how the Woods were key to the foundation of Scotland's huge shipbuilding industry, firstly in Leith and then on Clydeside. Joseph John Hugh Fawcett Wood of Largo succeeds his late father, Timothy Michael Herbert Fawcett Wood, as Representative of the Ancient Family of Wood of Largo and Chief of the Name. Council members' contact details can be found in the Members' Area and in national pages. In common with similar organisations, the Society is run entirely by unpaid volunteers on a not-for-profit basis. Clan Wood Society's family genealogist is Alex Wood of Linlithgow, Scotland. Visit the Members' Area. 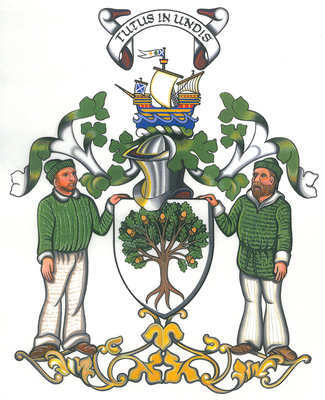 The Crest Badge shown as the Society's logo depicts 'A Ship under sail Proper' which is the Crest of the Arms belonging to our chief. The chief's Armorial Bearings are shown on this page with his approval. They must not be copied or used for any purpose without his expressed authority. On the other hand, the wearing by clansmen and clanswomen of a badge depicting the Crest (the topmost symbol) and Motto of their chief's Arms IS desirable. An image of their Crest Badge forms the flag of many clans and clan societies, and householders like to display it proudly at home - as a wall plaque, for example.